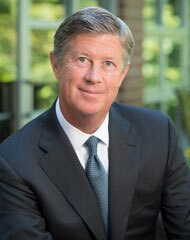 Mr. Fitzpatrick joined Greenberg Gibbons as Chief Operating Officer in 2006. After five years in this role, he was named President/Chief Operating Officer and is currently responsible for the company’s overall performance, managing all activities including development, leasing, asset management, tenant coordination, lease administration and accounting. Most recently, he directed very successful merchandising and leasing programs for Annapolis Towne Centre, Waugh Chapel Towne Centre and the Towne Centre at Laurel. Mr. Fitzpatrick came to Greenberg Gibbons with more than 25 years of experience at The Rouse Company, where he worked as Senior Vice President of Asset Management, overseeing all the development and operations for half of the Rouse portfolio. He earned a Bachelor of Arts Degree in Economics from the University of Pennsylvania. Mr. Fitzpatrick is a member of the International Council of Shopping Centers and volunteers at Habitat for Humanity.